Iron-air batteries promise a considerably higher energy density than present-day lithium-ion batteries. In addition, their main constituent – iron – is an abundant and therefore cheap material. Scientists from Forschungszentrum Jülich are among the driving forces in the renewed research into this concept, which was discovered in the 1970s. Together with American Oak Ridge National Laboratory (ORNL), they successfully observed with nanometre precision how deposits form at the iron electrode during operation. A deeper understanding of the charging and discharging reactions is viewed as the key for the further development of this type of rechargeable battery to market maturity. The results were published in the renowned journal Nano Energy. For reasons including insurmountable technical difficulties, research into metal-air batteries was abandoned in the 1980s for a long time. The past few years, however, have seen a rapid increase in research interest. Iron-air batteries draw their energy from a reaction of iron with oxygen. In this process, the iron oxidizes almost exactly as it would during the rusting process. The oxygen required for the reaction can be drawn from the surrounding air so that it does not need to be stored in the battery. These material savings are the reason for the high energy densities achieved by metal-air batteries. Iron-air batteries are predicted to have theoretical energy densities of more than 1,200 Wh/kg. By comparison, present-day lithium-ion batteries come in at about 600 Wh/kg, and even less (350 Wh/kg) if the weight of the cell casing is taken into account. Lithium-air batteries, which are technically considerably more difficult and complicated to realize, can have energy densities of up to 11,400 Wh/kg. When it comes to volumetric energy density, iron-air batteries perform even better: at 9,700 Wh/l, it is almost five times as high as that of today’s lithium-ion batteries (2,000 Wh/l). Even lithium-air batteries have “only” 6,000 Wh/l. Iron-air batteries are thus particularly interesting for a multitude of mobile applications in which space requirements play a large role. The insights obtained by the Jülich researchers create a new basis for improving the properties of the battery in a targeted manner. 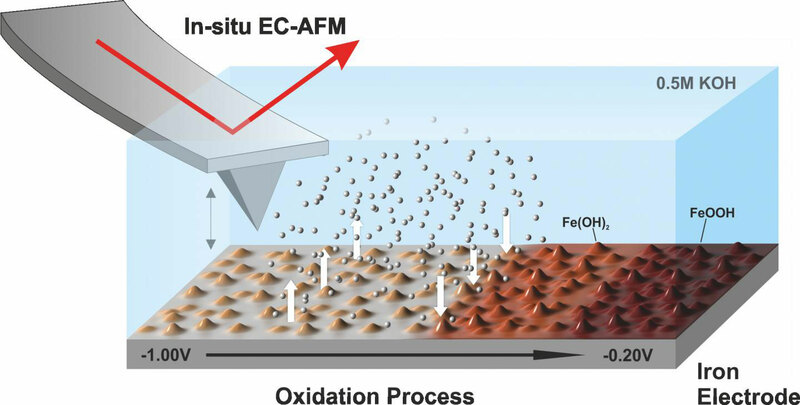 Using in situ electrochemical atomic force microscopes at the Center for Nanophase Materials Sciences at Oak Ridge National Laboratory, they were able to observe how deposits of iron hydroxide particles (Fe(OH)2) form at the iron electrode under conditions similar to those prevalent during charging and discharging. “The high pH of 13.7 alone represents a borderline condition for the instrument,” explains Henning Weinrich from Jülich’s Institute of Energy and Climate Research (IEK-9). “We were the first at Oak Ridge to successfully conduct such an experiment under realistic conditions,” says Weinrich, who stayed in the USA for three months especially for the measurements. The deposits do not decrease the power of the battery. 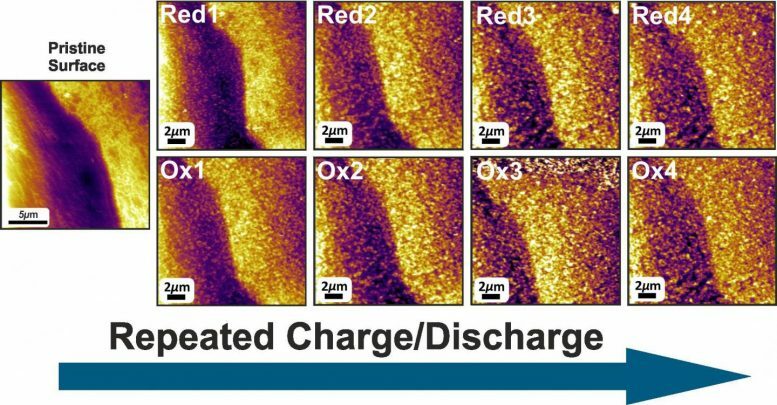 On the contrary, since the nanoporous layer increases the active surface area of the electrode, it contributes to a small increase in capacity after each charging and discharging cycle. Thanks to the investigations, the researchers have for the first time obtained a complete picture of this layer growth. “It was previously assumed that the deposition is reversed during charging. But this is obviously not the case,” explains Dr. Hermann Tempel from Jülich’s Institute of Energy and Climate Research (IEK-9). Furthermore, a direct link was verified for the first time between the layer formation at the electrode surface and the electrochemical reactions. There is, however, still a long way to go until market maturity. Although isolated electrodes made of iron can be operated without major power losses for several thousand cycles in laboratory experiments, complete iron-air batteries, which use an air electrode as the opposite pole, have only lasted 20 to 30 cycles so far. The results were obtained within the scope of a project on high-temperature and energy materials, which was funded by the German Federal Ministry of Education and Research. It was made possible through a cooperation agreement between the Oak Ridge National Laboratory and Forschungszentrum Jülich. Both establishments have been collaborating closely on various scientific areas since 2008. 3 Comments on "Iron-Air Batteries Promise Higher Energy Density Than Lithium-Ion Batteries"
Wow – this takes me back. We worked on Zn/Air & Fe/Air batteries back in the late 60’s at Energy Conversion Ltd. in England. The Zn/Air battery was not electrochemically rechargeable so was really a ‘hybrid’ – the Zn anode being a primary half-cell, which had to be replaced when exhausted, and the air cathode a fuel cell electrode. It all died a death when the military contract, and B.P. withdrew support and all other work on H2/Air, solid oxide, molten carbonate and phosphoric acid fuel cells was all terminated. What an appalling waste of time, effort & money & jobs for 70 people, many of whom were top scientists. All too early, I suppose. That aint good enough, though this is. “Braga and Goodenough have stated that they expect the battery to have an energy density many times higher than that of current lithium-ion batteries, as well as an operating temperature range down to −20 °C (−4 °F); much lower than current solid-state batteries. The electrolyte is also stated to have a wide electrochemical window. The battery’s design is safer than lithium-ion batteries, as the use of a flammable liquid electrolyte is avoided. The battery can also be made using low-cost sodium instead of lithium.